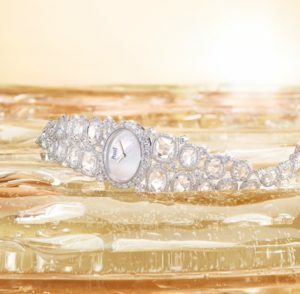 Swiss watch and jewellery house Piaget, founded in 1874 as a factory for the manufacturing of watch movements and components, traditionally has not been left out of the events of the Paris Haute Couture Week. 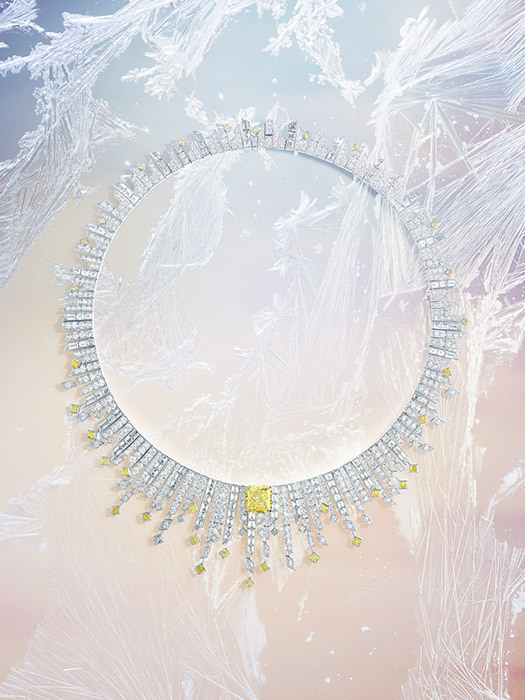 During the first week of July, the Maison showcased its new high jewellery collection entitled “Sunlight Escape”. The collection pays tribute to the sun in all its glittering glory and incredible nordic landscapes, embodying the admiration of nature and boundless freedom. These are jewels for the impetuous, secular appearance, bold, exciting, exceptional items. The “Sunlight Escape” collection consists mainly of three parts: Warming Lights, Exalting Sights, Dancing Nights. 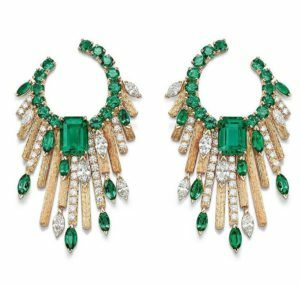 In the house of Piaget, they historically adore exotic, unexpected jewelry moves, and revere, perhaps, all conceivable crafts from the concept of Metier d’Art: embroidery, mosaic, micromosaic, marquetry and of course, enamels. The “feather marquetry” technique was used by talented artist Nelly Saunier, who has been working with Piaget for four years now, in the creation of four pieces, earrings and cuffs. 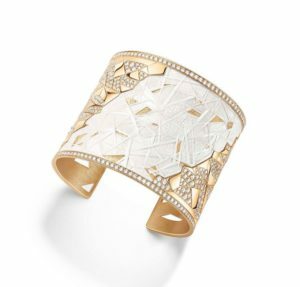 Golden Sunlight cuff, earrings which are a part of Warming Lights – a composition of absolutely white feathers contrasts brilliantly with leaves of pink gold, creating a flickering effect of frosty snow, sparkling in the warm sunshine. In goose and pelican feathers enhanced by 24kt pink gold, these unique pieces bear witness to the perfect harmony between feathers and jewellery. Another important technique to unveil is “palace décor“, an art-inspired engraving technique that is a hand guilloche gold with asymmetrical lines and “imitation”of raw silk. The result is a product with a soft texture, somewhat reminiscent of fabric, and an incomparable brilliance that emphasizes the glow of precious stones. An integral part of the collection of Sunlight Escape is the Midnight Sun parure, in which the technique of “palace décor” is well represented. 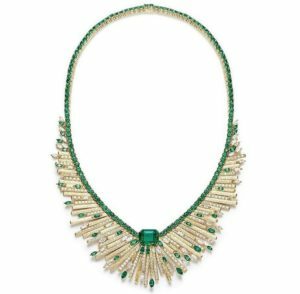 It combines marquise cut diamonds and saturated bright green emeralds. Exalting Sights is an ode to the beauty of a changeable nature, its power and its greatness in everything. 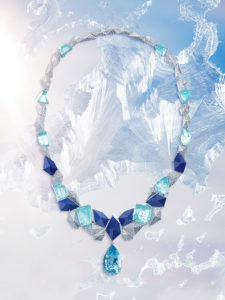 Infinite Blue necklace with a playful graphic design is encrusted with various stones of blue shades: lapis lazuli, tourmaline paraibas and aquamarines in combination with round cut diamonds resembling a sea foam. 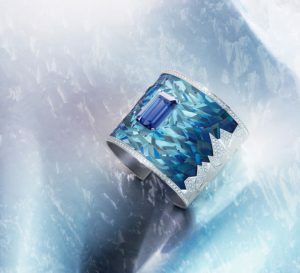 The spectacular Blue Emotion cuff made of delicate feathers, adorned with an outstanding 24,36cts emerald-cut tanzanite. Like the sparkling surface of a young iceberg, tourmaline cabochon of 24.73cts crowns the white gold ring with round cut diamonds. The night landscape of the northern expanses glows with bright colors, which inspired Piaget to create Dancing Nights parure. 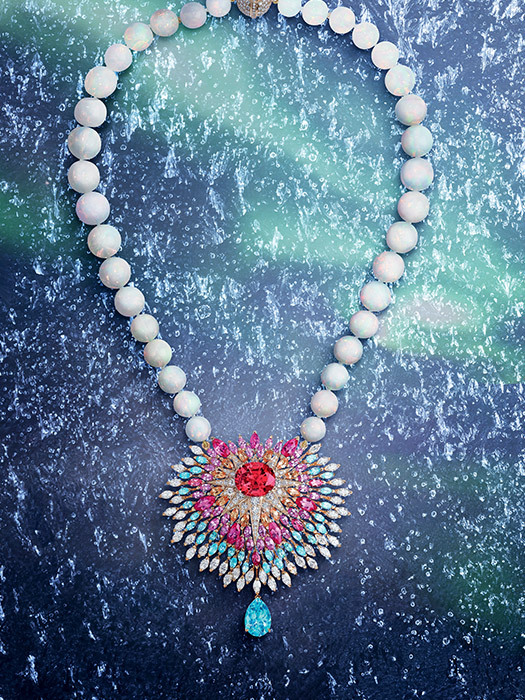 Blazing Sky transformable necklace and earrings comprise different bright, vivid colors of gems: an impressive pear shape paraiba, marquise cut diamonds, paraiba tourmalines, sapphires, orange spessartites and magnificent oval shape spinel-an infinite feerie of colors delicately hanging from white opal beads. 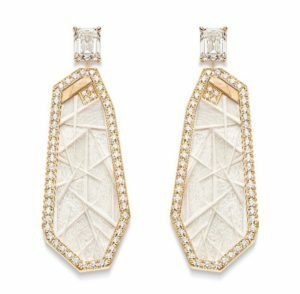 Matching earrings are centered with tender moonstones and framed with a myriad of fantastic coloured gems. 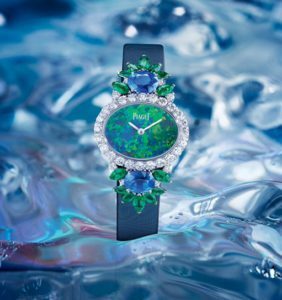 But, surely, Piaget is not Piaget without watches, which is a manifesto of the Maison’s precious style: Sunlight Escape watches embellished with diamonds pave, opal, sapphires, emeralds and fantastic lapis lazuli. 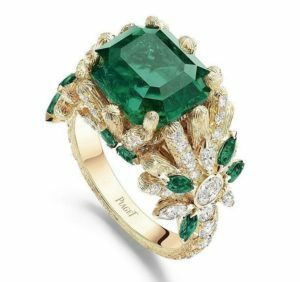 Piaget’s HJ collection once more demonstrated us its importance on the jewellery Olymp, proving to be the Maison which creates weighty jewels with unique gems of exceptional beauty and complex constructions in terms of jewellery techniques, but having sense in them and remaining romantic, lyrical, elegiac.